I don't know if it can be rightly called bacon in the purest use of the word. Bacon is made from pork. But this cured and smoked mutton belly is to me far more tasty than any bacon I've ever consumed. Even though I've been working with wool for a long time now, it's only recently I started thinking of sheep as a sources of food. Locally, lamb is a very expensive meat, and very limited. There are lamb legs, lam ribs and lamb chops... and nothing else. One would imagine there is more to a lamb than two legs and some chops. Mutton is unheard of here, not even considered fit for pet food. This is a shame. Traditionally, sheep have been a major meat source in Europe the Middle East, and North Africa. England especially has a long history of wool and mutton. The more I read about history, the more I want to cook what I read about. I wanted to experience mutton. And when I finally did, I found I liked it. I like it a lot. When prepared right (and by prepared I don't just refer to how it's cooked, how the animal is butchered and slaughtered have a large effect on taste and tenderness) it is exceptionally tasty. As I mentioned, I butchered a ram not long ago. There is a lot of meat on an adult sheep, and many cuts I don't know what to do with. The belly had layers of meat and fat, and I didn't want it to go to waste. Why not make bacon from mutton? So that's what I did. I used the Basic Dry Cure mix from the book Charcuterie: The Craft of Salting, Smoking, and Curing as a base for my mutton bacon. It's been reproduced so many other places that I'm feeling okay to post it here as well. You need to know that this book is a fantastic source of information and a great starting place for curing your own meat. Mixed all together really well, label, and store away from children and foolish people who might eat it accidentally. For this recipe, I'm assuming you have some basic curing experiences If not, try making regular bacon first. If at any point the meat smells rotten, has fuzzy or black mould on it, then toss it out and start again. if it gets a white mould on it, it's okay, but if the white mould is fuzzy then that's bad. Mix the cure together with the spices and extra salt. Coat the mutton in the cure, and place in a ziplock bag with any remaining salt-mix. Keep in fridge for about 7 days, massage the spices into the meat through the plastic daily. Should feel firm. Rinse the salt off and leave the meat to dry for at least an hour, uncovered in the fridge. At this stage you can hang to dry in a cool place for 1 to 3 weeks, or you can smoke it. I hot smoked mine with pear wood for 4 hours, then increased the temperature to make certain the internal temp of the meat was 140F or higher. You can store the smoked meat in the fridge for a few weeks, or freeze it. Which ever you choose, it tastes better for resting a day or two before slicing and frying or using the bacon in recipes. If it's too salty, then boil the bacon for about 30 seconds before frying. This is not an eat raw meat. After the curing and drying, I divided my mutton bacon in three parts. 1 part I hung to dry in my curing chamber, the other two parts I smoked. After smoking, half went in the freezer for later, and half went in the curing chamber to dry. I fried up a bit the day I smoked it and it's exceptionally yummy. I'm very curious what the dried bacon will be like, as I've never tried this technique before. The extra 1/4 cup of salt I used in this recipe may be optional. I just felt more comfortable using more salt because I intended to hang it. If you are just sticking it in the fridge after smoking, then you may not want to add this extra salt. but then again, the flavour wasn't anywhere near as salty as I expected, so I leave it up to you. Update: Of the three methods I used to make this - hung cured, cured and smoked then hung, and cured and smoked and put directly in the fridge when cool - I liked the third best. The first method of just cured and hung to dry developed some rather dodgy mold after a few days, so I tossed it. The one that was smoked, then hung to dry was okay, but I suspect the temperature wasn't even enough during the drying. If I had better temperature control, I think this would be my favourite method. Affordable cooking? - can be, especially if you are butchering your own side or whole mutton. Mutton use to be a very economical meat, but these days it's hard to come by. This is a cut that is usually discarded, or sold for making lard. Finding mutton belly, or whatever they call it these days can be very difficult and therefore expensive if you go to the wrong place. This is one of my favourite Korean foods. It's a bit like Japanese Sushi roles, but it's distinctly Korean. Just about everything in it is cooked before rolling. Takes a lot of prep time, but well worth the effort. Today's lunch, imitation crab, cucumbers cheese, carrots, and chard - hmmm... all starting with a C. that's a strange turn of events. Because everything is cooked prior to rolling up, this makes a great bento food. It's affordable and also a good party dish, where each person can make exactly what they want. Allergy friendly, and a healthy balance of ingredients. First Herbs of the Year - woot! First proper herb harvest of the year. Things are starting to grow, and I thought why not pick some to dry. In the basket are oregano sage, and thyme. I wish I could share with you just how good this smells. I barely ever used herbs before I started growing a herb garden. Funny how that happens. Warning: this post is about where meat comes from, home slaughter and butchery on the farm. It may not be for all readers. First time slaughtering my own animals for food on the farm has been a very emotional and spiritual experience We processed (a deceptively nice word for killed and cut up) a goat and a ram last week. It made a very strong impression on me, and as traumatic as it was, I feel satisfied that I did it, and will do it again. Trying to reconcile the fact that I eat meat with the rest of my values has been a long journey I want to be consistent in values and actions, to have my actions congruent with my beliefs. This has been one of the places where I seriously failed at doing so in the past. kitchen knife for cuts requiring strength, and on top a steal to maintain a sharp edge. With the goat and the ram, I had different friends do the actual deed (very interesting to see the difference in styles, but that's a subject for another time). Then I helped skinned the animals. Brought the flesh inside and butchered it. Took me about 3 to 4 hours per animal to skin and get it into freezer size portions - roasts, stewing/sausage square, cuts for hams, and so forth. It was really amazing to me to turn a living animal into food - I felt intensely grateful to the animals and it gave me a very different view of life. I learned a lot about myself. I learned that I don't ever want to make a killing stroke on an animal. This is really heart shatteringly difficult to watch. But I do feel I could do it if needed to be done, in a survival situation and there was no one else around to do it. I also learned that processing the meat myself made the emotional transition much easier. Because I felt so grateful I didn't want to waste anything. In a small abattoir or large slaughter house, they have what they call hanging weight. This is the meat minus the skin and organs. From hanging weight to packaged ready to go, the usual loss is 20 to 30%. For my half of the ram, I started with 40lb of meat, and after it was cut up ready to go, ended with 39lb of meat, that's a loss of only 3%. I'm keeping the fat for cooking and soap making, the bones for broth, the little scraps of meat for sausage and stew. Moreover, I know where each piece came from and can cook it accordingly. Gratitude to the animal is very humbling and reduces waste. Keeping the animal at home for slaughter, saves it a long trip to the abattoir, a journey that can take days of stress. On top of that, at the slaughter house, the animal is surround by other stressed out animals, and the smell of blood and other things that terrify them. Not going into details here, but at a facility, the animal basically has a stressful end. When I think back on the abattoirs and slaughter houses I've visited (big and small), I know how much I disliked the conditions. The conditions were clean and up to code, but that's not what bothered me. The way the animals end, the stress and fear that they display - because animals do display these emotions. On top of that, the facility butchers the meat, cutting it up according to their standards, which, quite frankly, are different than my own. With some things, I can be very fussy in the kitchen. At a facility that processes hundreds or thousands of animals a day, many perfectly good cuts are ground when they don't need to be. It saves a lot of time and energy for the home cook, but it also produces a lot of waste. It's better for the animals to have their end at home, and it's better for my kitchen economy to process the meat myself. Although I do need more practice and/or lessons to get the cuts of meat better. I also feel really bad for all the commercially processed meat I've eaten in my life. I don't think I want to buy meat again, not without knowing where it came from and how the animal met it's end. What am I going to do with all this meat? The Ram/mutton is mostly for eating. The fellow was only just 2 years old (in 19th C England, 2 years old and younger was lamb, whereas most countries now have the age at 12 months or less) and a very gentile personality. The meat is tender and mild flavoured, very tasty and perfect for roasts, fresh sausage, soups, stews, pasta, &c. I think I'll make a couple of small hams from the hocks, just to see what it's like dry cured. As for the goat, she was old and high strung. Her meat is mostly going for curry, dry cure ham, and dry cured sausage like Kabanosy - things that are slow cooked and spicy, or spicy and cured. Now keep in mind, home processing animals from start to finish is not an easy task - emotionally or physically. It's not at all like the books say it will be. If you want to home process your animals, here are a few things you need to do first. Check the local laws. Some countries no longer allow farmers to kill their own animals, or require a special licence or certification to do it - I have opinions about this, when it's done right, it's the most gentle passing possible for the animal, but it has to be done right. Other places like here, we can only kill our own animal on our own land for our own consumption If we want to sell our meat, it has to be processed at a government inspected facility. Another thing you need to consider is your neighbours. if they are within site of your yard, they may take issue and cause a fuss. Or they might come by and demand some meat for dinner. Last of all, have everything clean and ready before you begin, including somewhere to hang the meat, knives sharpened, freezer paper... &c.
I have moved into a small space on my living room floor. A little orphaned gosling is imprinted on me and panics if I dare to travel more than two feet away from it. Peep, peep, PEEP! the gosling when I get up to go do some chores. Explaining to this little creature that his new mummy has other animals to care for is, well impossible. Fire blazing, heat lamp on, and still the preference is for the warmth of mummy's lap. So here we are nestled together, me in my PJs and Gosey wrapped in a towel at my side. We have had a lot of beautiful new animals on the farm this spring, but it's also been a hard year for them too. We lost a Ewe and her two lambs, despite heroic efforts, 2 expert shepherdesses, 3 helpful helpers and 4, count them, 4 vets! It was very difficult to be part of that. We worked so hard, and the animals suffered so much. There was nothing more we could have done, not the best vet in the world could have saved them. But still... It's little comfort. New life, and death, and everything in-between. A journey of emotional extremes that makes me question if raising animals is the right thing for me. I have several friends who are vegan, vegetarian or have restrictions on eating certain flesh for religious reasons. I'm absolutely fascinated by their dietary style, mostly because it gives me a chance to access my own eating. I eat meat. I don't eat a lot at one time, an ounce or two is plenty for me. It's more a side dish than the main feature; however I still eat the flesh of animals. I'm not going to stop eating meat. For reasons of health and personal preference, I am a meat eater. There are certain nutrients in meat that I cannot get elsewhere due to my allergies and sensitivities An even bigger issue for me than health is that I think meat tastes good! So how do I reconcile my soft hearted attitude towards animals with my carnivorous tendencies? I was raised in a middle class Canadian home, during that no-man's time in history when food was what came in plastic and boxes with vibrant pictures on the package. Sure, we always grew our own vegetables in the garden, so I knew a bit about where that food came from. Yet, I always felt disconnected from meat. School and Television taught me that it was dangerous; that if the steak took more than an hour to go from the grocery store to the fridge, and you ate it, then you were going to die. I knew this wasn't entirely true, because people told me about our family's dubious history of poaching during the war (a time before refrigeration and yet people weren't all dead from eating meat, how strange), but it wasn't until I was in my teens when I really understood that the chicken and lamb that I was so fond of eating came from the very same animals that I played with at the petting zoo. It's a very strange moment in a person's life - one that wouldn't have happened, 75 or 100 years ago. It's a very strange part of human history that it happens at all. Natural instinct is to hide from the food chain to only think of meat as growing in plastic wrap, not as cute faces or pets. It takes decided effort to acknowledged this disconnect in our upbringing and face the fact that the meat we eat comes from animals. Living on a farm, as I do now, I've noticed time and time again, that the distinction between livestock and pets for most people, only happens after the slaughtered, butchered and packaged in plastic. I've also learned that if you cannot differentiate between livestock and pets, the animal suffers, often more than it would in a KAFO. I want to be able to eat meat and feel good about it. How can I do both with a Disney upbringing? I can either turn a blind eye to where my meat comes from, treating all animals as pets, while eating mass produced meat, or I can take an active step to ensuring the meat I eat comes from animals that have lived a good life, true to their nature, and had an end that was not stressful. I'm opting for the latter, but it is more difficult than expected. Tomorrow a goat will die. She was born angry and despite the best efforts of many people, grew more aggressive as she aged. Now she's attacked a child, no harm done to the child thankfully, but still, it was enough. I feel very conflicted. I am sad that a life will end. I am glad that the meat will be used. I am upset that she couldn't be redeemed I am excited for the chance to work with adult goat meat (mutton and goat are very hard to come by here). I'm also glad that she had the last few weeks of living the high life and that we can respect and honour her at her end. All these feeling turning round in my heart. It's really quite a landmark event in my life. I have a friend who will teach me the Halal style of slaughter, where the animal is made calm and content before the end - which comes quick with one stroke of the knife. So today I am getting ready - both emotionally and by sharpening my knives, making room in the fridge, preparing my recipes, and so forth. It's going to be an adventure. But at least I've done everything I can to make certain this angry goat meets a good end. I found this absolutely fantastic gadget at the local junk-shop the other day. 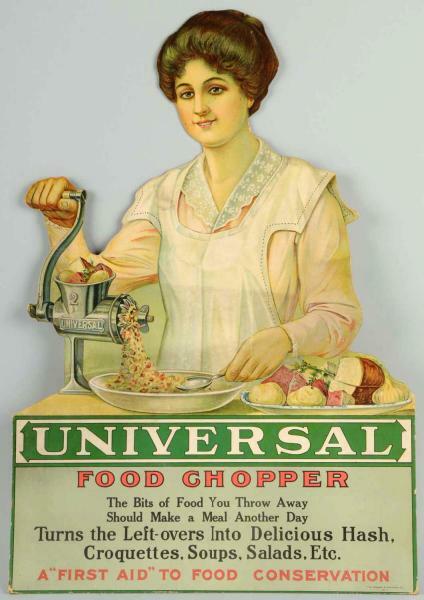 It's a Universal Food Chopper and it is just the tool I've been looking for. It looks like a meat grinder, but it does so much more. It can chop, crumble, and make a paste out of most anything. What it excels at is giving a whole new life to leftovers. Which is a good thing because in this household, we are notoriously bad at eating up leftover roast and veg. Leftover steamed veg usually go to the chickens, but instead I decided to keep them and make a shepherds pie from them and the roast. I used the coarse plate on the chopper to pass the broccoli, cauliflower and carrot through. Then I passed an onion through it. This all took less time than it would have to find and set up my blitzer. Next I more-or-less separated the meat from the gravy and passed the meat through the food chopper. It was a roast lamb shoulder that had been browned and then cooked with garlic in a puddle of red wine. The juices from the roast combined with the wine to make a fantastic gravy. Oh, I put the garlic through the Universal too. Last of all, I took a few slices of sourdough bread, chopped them up into about 1 inch cubes and passed them through the chopper to sop up all the juices. In a large bowl, I mixed the chop stuff with the gravy and added some wine or beer or it might have been apple cider - whatever I was drinking at that time. I even threw in a small handful of frozen peas and corn because I worry that we don't eat enough veg. Salt and Pepper, and if I had thought about it, I would have added a finely chopped sage leaf. (If you don't have enough gravy you could mix a stock cube or a spoon of Vegemite with half a cup of hot water, then add to the mix). Put filling into your baking dish, cover with mashed potatoes (leftovers or fresh or a blend of both). These are mini-pies to go into the freezer for future dinners - there's only so much shepherds pie one family can eat at a time. We put goat cheese and paprika on top. Since everything is already cooked, you just need to heat it up enough so that the lovely juices bubble up and hopefully add a slight flavour to the mashed potatoes. Somewhere between 30 min and an hour. I apologize for this photo, but keep in mind, most of the family is just really hungry and quite often they serve themselves before I have a chance to find my camera. But you get the general idea: chopped up leftovers in a gravy on the bottom and mashed potatoes on top. It's a very British pie to make Mrs Beeton Proud - and is a True Shepherds' Pie. It was made of lamb for the shepherd to eat while tending to the sheep. Affordable cooking: Yes! All leftovers that may or may not have died a lonely death in the back of the fridge. You can bulk this out with extra veg or even a bit more bread in a pinch. It's great for feeding company that is here for a few days in a row, so they don't get board of eating the same leftover roast beast day in and out. Allergy Friendly: Yes! Change the ingredients and sauce to suit your needs. Allergic to potatoes? Use bread dough or pastry dough for the topping. Healthy: Yes! It's a well balanced meal and you can always serve it with a salad. It is NOT ACCEPTABLE to serve this to your vegan friends.